Bruce Lee is one of those extremely rare examples of a human being who reached his physical, mental and spiritual potential. Most people only have passingly heard of him as an actor/martial artist but have no idea how driven he was toward those aforementioned human attributes. PHYSICALLY he trained up to 16 hours a day, and could perform miraculous physical feats, which required intense MENTAL concentration. Spiritually, he pushed philosophy to the boudaries of understanding which is where he realized his famous quote in the title of this post. The accompanying YouTube is worthy of your viewing. It is the documentary we are discussing, Bruce Lee, A Warriors Journey. Remember the old TV detective show Longstreet, about a blind detective in the early '70's? Well, I guess I've dated myself now! Bruce made a cameo appearance on a few episodes and give some powerful philosophical messages... "Without method, what is there to teach?" "I have found the cause of my ignorance" "Be like water, my friend". His dream was to create a TV show entirely about Eastern Philosophy and that is what birthed one of my favorite shows of all time... "Kung Fu". The producers were nervous about him, being oriental, being the lead, so they chose David Carradine. When asked in an interview about how he felt about that, his answer shows the depth of his maturity. "You must be a light unto yourself! In a world that is in utter darkness"
Lit up like a Christmas tree on the shelf. That book is essential reading to anyone endeavoring to Know Themselves. Most of us do not seem to realize this; that the world is my relationship with others, whether one or many. My problem is that of relationship. What I am... that (is what) I project, and obviously, if I do not understand myself, the whole of relationship is one of confusion in ever-widening circles. So, relationship becomes of extraordinary importance, not with the so-called mass, the crowd, but in the world of my family and friends, however small that may be, my relationship with my wife, my children, my neighbor. that alone is real reformation, a radical, continuous revolution. We are afraid to begin on a small scale. Because the problem is so vast, we think we must meet it with large numbers of people, with a great organization, with mass movements. Surely, we must begin to tackle the problem on a small scale, and the small scale is the "me" and the "you." Lay down quietly and listen to this at least once per day and amp up the Magic in your life!!! In Your Imagination of which this World of Mortality is but a Shadow." You may ask yourself what Blake is talking about, yet this is the language of the Bible. 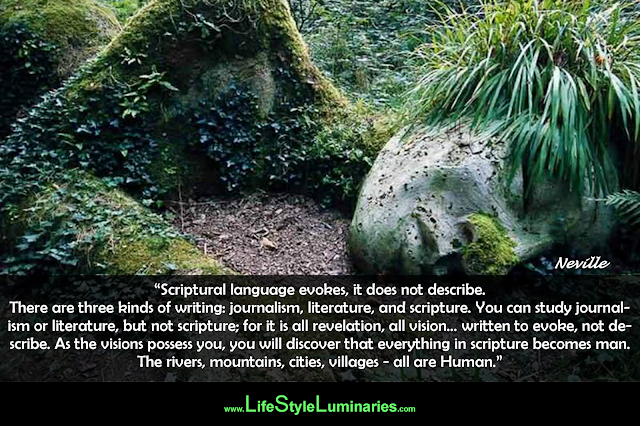 Biblical language evokes rather than describes. It is telling of another world, another Man and another age; for in truth, all of the places in the Bible are aspects of human consciousness. EVIL-ution? or a time to grow up? Have you noticed that everywhere you turn, people are clamoring for trans(trance)formation? Whether it is from the religions of the world, or New Age'y mysticism, people are trans(trance)fixed on becoming something better than they currently see themselves as being now. People are mentally bamboozled into believing that something, greater than them, is going to save them whether it is Science, Jesus, Allah, medicine or benevolent aliens from another, "better" world. And this feeds into the idea of evol(Evil)ution which claims that we (human beings) are just a cosmic accident of mutated desperation facilitated for survival... And for absolutely NO apparent reason! REALLY? 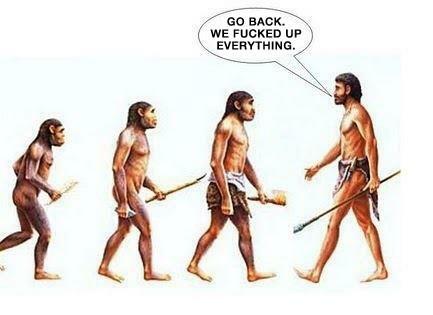 Yet, people want to Evolve. they seem to love the idea of becoming something greater and I am suggesting that this is only possible because they are conditioned NOT to see their own greatness. The bible talks of "Grasshoppers in a land of giants" (Numbers 13:33 And there we saw the giants, the sons of Anak, which come of the giants: and we were in our own sight as grasshoppers, and so we were in their sight.) We make ourselves feel small compared to the seemingly great and self-created Giants of government, business, religions, medical, entertainment and education. The Information-brokers, the, "Expert-Class", of the world assert their dominance over the less informed and their power seems absolute to the ignorant. But these knowledge-brokers stand in the nakedness of their own ignorance to the truth of the oneness and brotherhood of humanity. Time for both to grow up.